projectors. With time, as slides and negatives were replaced by digital technology, and the projectors became more difficult to use, the photographer's family had the images scanned in digital format and put onto cds in the late 1990s. Now in 2011, reproduced with identifying captions on unbound manuscript pages, they are available for viewing online. 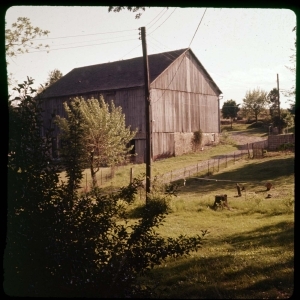 These images represent the project of Dr. Armine Taylor Wilson who worked to capture all the wildflowers in a five to seven mile radius of his home in Chadds Ford, Pennsylvania. He also photographed many of the historic buildings in the area. They would appeal to those interested in botany and the environment, the history of southeastern Pennsylvania, projects that involve family members of all ages, and documentation of a rural area in the throes of change after the Second World War.